Its Rakhi Day today. And it’s a forgotten day. Rakshbandhan has always been a very special festival for me. An occasion close to my heart actually. When I come to think of it, this is probably because I have no brothers of my own and many cousins all of whom are so distant I don’t even know their names. As such, I have looked for a brother in all my guy friends throughout my childhood and early adolescence, tying rakhis to anyone and everyone who showed even a glimmer of fraternal promise. In fact, in school I remember it used to be all about quantities…the more rakhis you tie, the more brothers you have and it used to be akin to some kind of a status symbol. I realize now that all the girls who participated in what I have now come to believe to be a very foolish and superfluous act, all had real brothers of their own, who would get the real meaningful rakhis. And I was the dolt tying rakhis to all the boys around thinking I was doing the meaningful thing. 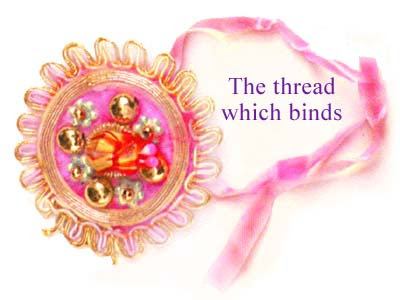 Im not saying it held no meaning because every rakhi I tied was imbued with sincerity and a lot of love. And Im sure the “brother” felt the same way too…at least momentarily. But somehow I began to find that as time passed, all the “brothers” whizzed by with their lives and I was left alone to search for new hands to tie rakhis to. It was kind of sad –me going around looking for that brother that I so desperately wanted to share my life, my jokes and my sorrows with. Someone who would be proud to have me for a sister. Someone who would dote on me as if I was the single most adorable sister in the world. Yes I wanted a brother. Sadly what I got was “muh bola bhais” in the real sense of the word. My bhais from school, all went their separate ways and now speak to me probably once a year-when I call them on their birthdays. Needless to say not a single one of them called/wrote today. I don’t even know where they are and what they’re doing. My bhai from junior college who I loved dearly, decided to make all efforts to move away from everybody who knew and loved him and pursue the career ambitions that plagued his dreams at night and thoughts in the day. I have not received a phone call or mail from him today. Neither did I hear from one of my most beloved brothers who cheated death to live his life. Come to think of it I rarely hear from him. My one brother from degree college did speak to me on skype today and thankfully I got to give him a virtual hug-The only sisterly thing I have been able to do today. The brother I have been tying rakhis to for the past few years in Singapore also didn’t call till I gave in and called him only to hear that he couldn’t make it today. Maybe I’ll see him later this week or over the weekend. Maybe I won’t. I have realized that I don’t care about reciprocation anymore. When one expects things, one prepares oneself for imminent hurt. This is not to say that my love for the special “brothers” of life have declined in any way. Neither have my fond memories of them . I will always love them just as I always have, because my Guru has taught me to love divinely and selflessly. So there is no question of returns. This year Rakhi Day was different. There were mithais and rakhis sent to Sushil by his sisters as usual. (They always arrive like clockwork every year). I did not send anyone any rakhis, nor did I send them any rakhis. I didn’t receive any gifts nor did any one offer his brotherly love and protection for all eternity in return for my rakhi. Yes this Rakhi Day was different. Because I stopped trying. Love should be selfless, but certain relationships work when there is some kind of energy flow both ways. And wonder of wonders when I stopped trying so hard, I found a brother who shows much more promise than any of the “brothers” I have known and run after these many years. He called me, and was genuinely sad about not being able to see me on Rakhi Day. Most importantly he sent me all his love. That’s pretty much what a sister looks for isn’t it. Quantity never matters. Quality always does. I have always had many passing acquaintances, but only a handful of friends I would trust my deepest darkest secrets or my life with. I cannot understand how the same principle never applied to my long time search for brotherly affection. It does now and I am certainly a happier person. Rakshabandhan was dismal and paled compared to the earlier flurry of activities I used to be involved in. But future Rakhi Days will be more real. ‘Real’ Rakhis, ‘real’ feelings and yes-a ‘real’ brother or two for me to love and cherish not for a few months but for many years to come. Happy Rakshabandhan Twinky. U sound "wisdomous" Picardo...and what you say holds true in every sense. I think these realisations have started coming to you post re meeting me :-) lol lol lol...but yes i reiterate...its true. I have often heard about this sentiment that you hold so close to your heart. I know it saddens you somewhere inside that you never had a brother that you could call your own no matter what and who would always reciprocate no matter what, whatever the circumstances might be. But you have always been a giver and maybe this too is His way of bringing out the best in you.